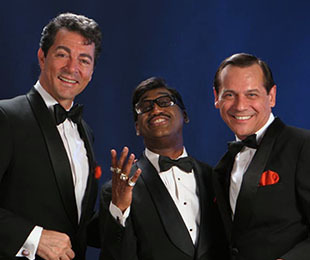 We are happy to introduce one of the hottest variety acts in the business, The DLE Rat Pack! They are THE best Rat Pack artists in the world featuring a handsome and talented Dean Martin tribute artist and superb Sammy and Frank tribute artists. They are terrific vocalists, put on a great show and are very entertaining! Our Rat Pack performs throughout the U.S. and around the world. Because they are in-demand, we suggest clients book them well-in-advance of their events. This is their “live” video recorded while they were performing on a cruise in early 2015. 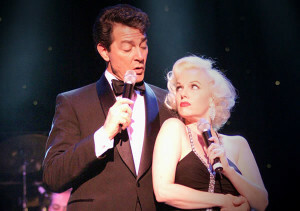 Our Marilyn Monroe impersonator-lookalike is available to perform with our Rat Pack. Our Dean is also one of the best emcees in the business. For booking information, please call (650) 282-5009 or email us from our Contact page at https://davidlevinent.com/contact.